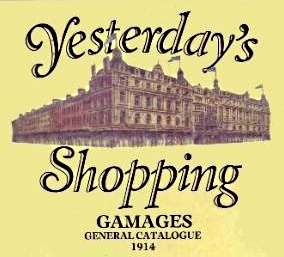 A. W. Gamages Limited was a large department store in Holborn, London, England from 1875 until they closed in 1972. We don't have access to the stores history, so the doll information here is gleaned from catalogue's and advertisements, the earliest we found is from 1902. Phyllis dolls, Red Riding Hood doll, Sailor Boy doll, Salome doll, Sambo's Baby Brother doll, Sambo's Sister doll, plus many other dolls until Gamages closed their doors in 1972. See our English doll makers page, as certainly Gamages carried dolls from any of these companies during the time they were both in operation.